In October 1953 Brian McCormack, a native of Castlebar, Co. Mayo, entered the Colonial Service and took up employment as an agricultural engineer in ‘Mid-West’ Nigeria. Just five months into his contract on 20th March, 1954 he died from natural causes while inspecting a rice plantation project near Agenebode, a 2-hour drive from Benin City where he lived. His body was brought back to Agenebode where he received the Sacrament of Extreme Unction. Bishop Patrick J Kelly of Benin City was present at the mortuary for the removal of Brian’s remains to the Holy Cross Cathedral in Benin City. The funeral Mass took place on 22nd March, 1954 at Holy Cross Cathedral. In attendance were Bishop Kelly SMA and Fathers Michael McFadden SMA, also a native of Castlebar, Joseph Stephens SMA, Joseph Hilliard SMA, Thomas Murray SMA, Joseph Conboy SMA, William Kennedy SMA and James Conlon SMA. All but the last two have gone to their eternal reward. Fathers Conlon and Kennedy now live at the SMA House, Wilton, Cork. After the Mass Bishop Kelly accompanied the funeral to the cemetery where he blessed the grave and led the prayers of Christian Burial. Brian, Sr. was born in 1917 into a family of 9 boys and 5 girls. Two brothers, Joe and Ger, and a sister, Eileen Irwin, still reside in Castlebar. Brian’s sudden death was a huge blow to his wife, Patricia, who is still hale and hearty and living in her native Dublin, and the other members of his family. His two sons, Paul, born in December 1951 and his younger brother, Brian, born in November 1953, just after his father had gone to Nigeria, were not old enough to fully understand the circumstances surrounding their dad’s death at the age of 37. Their mother remarried in 1956 and had 5 more children, 3 girls and 2 boys. Her second husband, Frank Sweeney, died in 1987. The subject of Brian’s sudden death so far from home was scarcely ever mentioned over the years. However, in recent years Brian Jr., who lives near Ennis, Co. Clare became friendly with Mr. Tajudeen Busari, a native of Nigeria, who has been living in Ireland for the past twelve years. They started to swop stories and mention of his dad’s death in Nigeria all those years ago nurtured in Brian’s mind the desire to locate his father’s grave. Brian began his quest for information about the whereabouts of the grave by contacting the Colonial Office in London. No solid information emerged. A letter written by Fr Michael McFadden SMA who was working in Ibadan, Oyo State and had attended the funeral Mass in Benin City provided useful information about Brian’s death and the details about the funeral Mass and burial. In the letter Fr McFadden mentioned the names of the priests who attended the funeral Mass. In addition, Brian’s cousin, who had spent some time in Kenya, advised Brian to contact the Society of African Missions (SMA) in Cork City. He promptly rang Fr. Fachtna O’Driscoll, SMA, the Provincial of the Irish Province, who informed him that another Irish SMA, Fr. Peter McCawille, SMA, was working in Benin City. Brian contacted Fr. McCawille with his request for information. 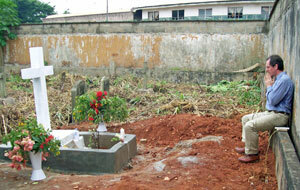 There are three major public cemeteries in Benin City. Fr McCawille visited all three searching for any information about the whereabouts of the grave of the late Brian McCormack Snr. Progress was slow and largely unproductive. At one stage he was told by one of the local church members that he was engaged in ‘an impossible task’. However, just when it seemed unlikely that he would find the grave he wandered into Holy Cross Cathedral (where Brian’s Funeral Mass had taken place nearly 56 years before) compound to talk to some of the older members (parishioners), hoping that one of them might have some recollection of what cemetery was in use at the time. Incredibly, he met one man who felt sure that in those days Europeans were buried in a cemetery close to the former Police Station. That compound is now occupied by Edo State Hospitals Management Board. Thanks to the kindness and co-operation of the Chief Executive of the Hospitals Management Board, Dr. M. A. Osumah, and the Secretary, Mr Ofure Oriafor, the grave was located. On the initial visit the place was overgrown with tall grass and it was impossible to recognise any graves. However, Mr Oriafor graciously assured Fr McCawille that the grass would be cut the next day. True to his word, when Fr McCawille revisited the cemetery on the Tuesday morning the cemetery was cleared and with the help of some photos that had been taken of the grave shortly after the burial and a name plate which was sent by the extended family and on which were inscribed the words ‘In loving memory of Brian McCormack. Died at Auchi. 20th March 1954. R.I.P.’ the actual grave was located. It was a defining and joyous moment. Fr. McCawille immediately communicated the good news to Brian, Jr. who was about to leave Ireland on a wing and a prayer on his journey of discovery to Nigeria. Brian McCormack and his friend Tajudeen Busari arrived in Benin City on Sunday, 7th March and visited the grave the next day. It was a hugely emotional moment for Brian, standing at the grave of the father whom he had never met and who had died almost 57 years ago to the day. He immediately alerted his mother and the extended family by phone to his discovery. He spent the next two days with his friend, Tajudeen who is a Muslim, tidying up the grave and painting it. A Mass was celebrated by Fr. McCawille in the cemetery on Wednesday, 10th March, to which all those local people who had helped in finding the grave were invited. Brian served the Mass mindful of the fact that his father Brian, Sr. had also served Mass every day on board the ship, the Aureol, which had brought him to Nigeria in the company of many Irish missionaries. Before the Mass Brian placed a laminated photo of his father and a card from his mother on the grave. After the Mass he carried a memento from the grave and the candle used during the Mass back to Ireland with him. For all of us gathered around the grave it was a rare moment of great celebration and intense joy. Almost exactly fifty-six years since his father was buried in Benin City, Nigeria, Brian McCormack, Jr. fulfilled a dream and stood at the grave and talked to the father that he never met. It was the crowning moment in a miraculous spiritual adventure. Our picturee shows Brian Jnr praying at the grave of his late father. May Brian Senior rest in peace until the day of the Resurrection. Previous articleWHAT DOES COIS TINE DO?